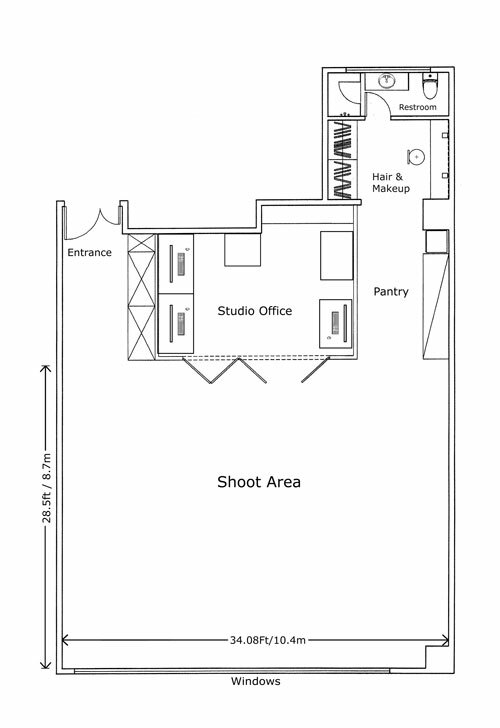 The studio has a clear shooting space of 34ft x 29ft and 12ft ceilings (clear to 10.3ft beams). One wall (32') of windows makes for excellent for daylight shots or alternatively with black-out curtain for complete darkness and privacy. Other facilities include make-up table with both tungsten and florescent (daylight tubes) lighting, pantry with Nespresso Cube coffee machine (free use) , fridge and microwave, change room and separate bathroom with shower. Full split type air conditioning in all areas of the studio and power charge is included in the rental fee. Assorted white boxes and reflector boards also included. Full day hire (10hrs) is to start & finish between the time of 8am - 8pm. If you require to start or finish outside of these time a charge HK$200.00 will added per day of hire.